Gary J. Shipley, Theoretical Animals, BlazeVOX, 2010. "Like floating down a divinely limitless fluvial junkyard, like knowing in ever more concrete and literal ways that life is a corpsy dream from which you do not wake, like moving along an opium-stream of deathly imagining towards some sea that only invisibly and never arrives, like some gnostic conspiracy in which certain favorite authors (maybe Baudelaire, Lovecraft, Lautréamont, McCarthy, Rimbaud – “Si je désire une eau d'Europe, c'est la flache / Noire et froide où vers le crépuscule embaumé / Un enfant accroupi plein de tristesses, lâche / Un bateau frêle comme un papillon de mai”) would be only indigent fellow informants . . . reading Theoretical Animals places one in a terrifyingly vexed position – traumatic and unspeakably hopeful – of being singular witness to the diurnal drama of cosmic crime. To ‘review’ it would be wrong, a violence to the kaleidoscopy of a truth that is prismatically evident in each opening of the page: “I can’t believe I’m still waiting to get out” (102). I cannot read the book in modern, serial fashion, but must only consult it oracularly, like a sepulchral tome of inverted koans. And this haptic relation is continually mirrored in its murderous mudlark world: “Half an arm, cleanly severed at the elbow lays hidden in a riverbank slagheap. On the inside of the wrist is a skull with coded teeth. . . . One is led to suspect that this is not an isolated instance, that this has happened before and will happen again” (64). There is no end to the consultation, to the violence of our freshly wanting to know what it is all about. Proving the magic, this is what the text now says about its use: “Sticky patrons wriggling from the waist down discuss the importance of hermetic precautions. At specific intervals each reads aloud from one of the many instruction manuals fastened to the walls with thin blue ropes” (59). A philosophical consolation, but one in which, around the flabby gravity of bodies, philosophy and consolation are only mutual, manual laminates. 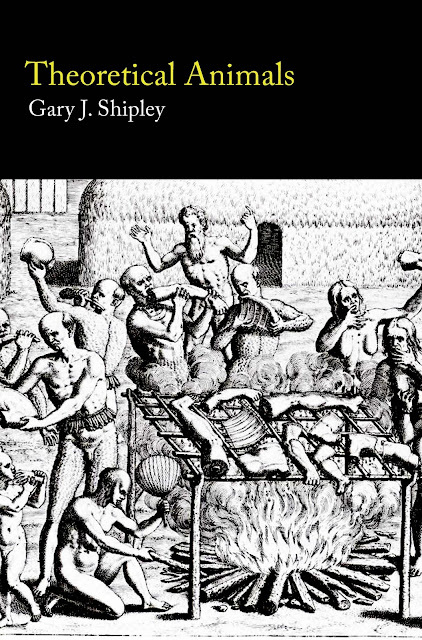 Gary J. Shipley is not for everyone, yet those of us – aficionados of the grotesque and macabre, who come upon his work realize right off the bat this is the real deal. Few can travel into these perilous waters without getting burned, much less scorched by the forces below the threshold. Shipley makes it seem simple, as if he were born of this dark carnival, complicit in its revealing and its apocalypse. Thing is about Shipley he’s been mutating ahead of us for a while now, going where most of us only envision nightmares never realizing the truth of our waking lives was staring us in the face all the time. Gary strips us of our filters, strips us of our protective Human Security Systems, lays bare the world around us that for the most part we would rather lock away. A world that is both vital and full of forces unregistered in the hinterlands of our psyche. Gary inhabits this interstitial zone for us, brings us to the limit, to the brink and opens our eyes to the monstrous beauty of the earth we for the most part are blind too. Gary lives there, a modern day shaman whose travels in transit, voyage into an infernal paradise by way of an updated mapping of the old Tibetan Bardol. Given his temperament and tendencies toward a completed nihilism, one may need to short list his discoveries, catalogue the secret ruins he’s uncovering to understand the itinerary of his travelogue journals. Take a recent adventure, Theoretical Animals. Set in a near future graveyard of our world, a London in post-Apocalyptic demise. Here he wanders the shadowlands of its extreme collapse forging from secretive and forgotten knowledge the collective memories we can only hint at: those compositions and decompositions of a collapsing thought world, the detritus of a thousand lives spent forgetting time and history only to be resurrected in a realm this side of reality – a place some philosopher’s used to term the Real. Shipley conceives this fantastic zone within a conceptual framework of visionary materialism that rewires the very nerves to adapt the wary intruder into a world no longer human, or much rather – in excess of humanity, a world at once disconnected from our very past, yet barely composed within the meta-instability of its darker catastrophes. Here what remains of the human lives out its meager existence in a woven semblance of a locked-in prison house of decaying security systems, inhuman algorithms, manufactured relays between rhizomatic labyrinths – cold, cruel, icy worlds of pure vitality. Each paragraph is set off typographically with bold typeset, set adrift on the blank sea of the page like a prose poem stretched across an abyss, each word lost among its distempered fragments like members of a lost tribe seeking a key to open the imprisoning cell they’ve been tossed into. This is prose at the breaking point of intelligibility, a carefully crafted enactment where words inhabit the thing they reveal, live the life of the blackness they perform. Hyperstitional habitations of linguistic models from a future that is already collapsing within our brains, revealing the threads of a supernal world of rich and lavish pain where the sacred violence of our secular wastelands gives way once again to the dark gods of old. An atheistic paradise where the constructions of material excess reveal the darkness to be alive, a welcoming to the horrors and terrors we’ve all been seeking under the cover of reason. Children of the Enlightenment we’ve come a long way to die at the hands of our own progeny, become victims of our own complicity in creation – a creation that is at once catastrophe and apocalypse. In the distance unseen “mothers wail from the shore, the robbed stares of their loss hidden, aural guests coiling hair-brushed poison to our table”. One imagines Dante’s Inferno, but that would be to spare the reality for a fantasy which Shipley will not let you do. No. You will be entreated to no longer turn your head away, assume it is all a matter of tropes, allegories of some future punishment; instead you are living through the truth of your own future, a future that is full of terror and beauty, of death and decay. A place that fascinates and repels at once. This is a place where even a “sentence of diluted intensity and common violence” washes up and washes out among the dark contours of your mind like presentiments of world that surrounds you already in the shadows of each step you take. A world that peers back at you in the innocent gesture of a young girl reaching out to you for a dime or nickel, or from the alleyway where you see an old man digging through the trash bins for bottles or who-knows-what. Yes, this is the world we are all constructing together, the ruins of our civilization at last revealing what lay there in the tumbling stones all along. A world where “numb voyeurs adorned and physical / crumpled memories stored for cold future” lay there silently in the dustbins of the future like broken toys gathering dust in a forlorn attic. Gary J. Shipley & Kenji Siratori, Necrology, CreateSpace, 2010. "An exercise in sensory overload from the minds of Kenji Siratori (Blood Electric, Acidhuman Project, Mind Virus, etc) and Gary J Shipley (Theoretical Animals) that pushes the limits of both human expression and that which can be assimilated in terms of socially-sanctioned pattern-recognition. Self-referring, auto-cannibalistic texts that hover and shimmer around the borders of the asemic, yet still retain a vivid relevance to the current post-human cultural landscape. A cyberpunk katabasis beyond Burroughs or Guyotat. With an Appendix by Reza Negarestani Published by Paraphilia Books." "Gary J. Shipley, Kenji Siratori & Reza Negarestani interviewed by David F. Hoenigman. 3:AM: Necrology (Paraphilia Books) has been referred to as a “cyberpunk katabasis beyond Burroughs or Guyotat,” but how do you see it? Gary J. Shipley: Two freshly spliced entities – joint terminals of biocapturism – united in carnal bonds eradicating the binary presuppositions of their former corpse incarcerations, those old emotions reduced to catabolism, human tissue into gas – skin traumas shaped like the beyond of flesh. Kenji Siratori: Just like the soul of the cadaver that fills the thin placenta of the stratosphere that is split to the human body of anonymity in the earth of before dawn. Reza Negarestani: An undead machine imbued with the chemistry of putrefaction and nigredo. 3:AM: The use of two-column pages is an effective way of uniting and blending the main bodies of text. Can you say something about how the layout relates to the book’s subject matter? GJS: In both I see mechanized deformities fused and serialized in medieval warrens – prophylactic dreams shrieking summer’s dazzling geometry all worm-eaten – bouquets of snapped bones growing up chamber walls, nigredo bodies looped malignant, coffined in phases like excrement. I see two corpses tangoing in bonds of blended tissue and fat. KS: Notified to the counterclockwise brain of the fatalities: blood gets thirsty….the brain of the twin raped mutual soul: the brain of the drug mechanism of the ant that the DIGITAL_placenta of the paradise faints in agony to the milligram tears of the rapture. RN: If the intelligibility of the world must thus imply a ‘face to face’ coupling of the soul with the body qua dead, then intelligibility is the epiphenomenon of a necrophilic intimacy, a problematic collusion with the rotting double which brings about the possibility of intelligibility within an inert cosmos. 3:AM: Death and decay haunt every page. Would it be fair to call this a horror novel? GJS: Whoever concocted the world did so under the influence of monsters, incarnations sired from states of self-reflexive revulsion. Reality is horror – it eats people like a carnivorous fog – a construct so diabolical that man has been unwittingly cajoled into adorning the effervescence of his dreams and his fantasies with costumes of malleable terror: ghouls, hybrid creatures, fused entities, seditious organs and limbs, malignant slimes, mythic decapitations, supernatural possession, psychotropic pestilence, brains worm-eaten with paranoia (insanities of truth)… myriad extremities of man’s dull fug. KS: The horror-show of the hells of the various mode cells of the bodies of myself which her cold machine erodes in sponge form heaven. RN: Horror stories are inherently concerned with decay even if they deal with other themes and dabble in other affairs. 3:AM: Can you say something about your writing practices? GJS: I go eavesdropping on the polluted organs of mangy wolfmen, on the toxic urges of a skeleton’s lower brain un-policed, all the while mouthing flat graphomania fertilized by nihil rains of incoherence. KS: I love/cut the play projects the narcissistic blood of the larva that ocean creature send back out the storage that was turned different violently to the eye of the DIGITAL*rhinoceros of the sun on the mirror of chaos. RN: A pact with putrefaction must be made; the moment of nucleation with nigredo, as we must call it. 3:AM: What do you see in the black slime that these bodies of text are destined to become? GJS: Cloistered hollows of dog cadavers, flies drinking, vomiting internal shadows. A vampire’s bitter dreams shadowed by children looking to do in a soul before tea. Sprung carcasses rooted in death and flowering in the despair of inevitable absorption. KS: The lung of the centipede that turned with the space of the filament of the blackhole and tear so tokage revolves and secretes to body outside so the machine of the drug atom dream of the virus that regresses to the face of the black apocalypse of the sun. RN: The two necroses of the soul upon which the universe and intellect are fixed bringing about the possibility of ontology as a great chain of corpses whose arrangement is determined by their explicit and implicit indulgence in necrophilia. 3:AM: What might the reader find if he/she reads down the middle? GJS: What the mechanics of paradise looks like to something that is not only born to die, but cannot prove to itself that it wasn’t born dead, that all fetuses don’t fall dead from the womb, their faces fat with autolysis, and that all the psychological trappings of adulthood aren’t just the nightmarish symptoms of protracted decomposition. KS: Like the womb skin of the chameleon there I attached twice and zero=not to inhabit to the nightmare=lung ball. … The wave machine of hell alternates. RN: By virtue of this distance, openness and survival, the first and the second necroses negatively reinforce and contribute to each other. 3:AM: How would you suggest the reader approach this book? Or is there something to keep in mind as one reads? GJS: Like some sentient mildew on the dead flesh of life. KS: With a brain to the impregnation system that velocity of light was transmitted/to the image in the night that the unknown quantity comes flying nonexistent outlook that is the butterfly that was folded up the eyeball that falls****. that lost the focus hangs space in the deep sea of the drug and the sun or the larva of the comedy. RN: What is itself consumed cannot sufficiently guarantee the exhaustion of that which correlatively succeeds it. 3:AM: The dead, the half-dead and the living all seem to merge into one. How do we tell them apart? GJS: The dead only speak of death as of a dream; whereas the shared insanity of human kind is always to live death and only dream life, and then only to dream it dead, unyielding, rigor mortised. The alchemy of self-reflexive decomposition: souls cooked black as shadow and smeared on the walls in the shape of men. KS: I broke make nonexistent I am mad with joy the one that erodes death and at the lightness of the suicide that cadaver invaded a certain membrane there and hell of striking the insincerity without the limit of the naked body. Gary J. Shipley, The Death of Conrad Unger: Some Conjectures Regarding Parasitosis and Associated Suicide Behavior, Punctum Books, 2012. "The death by suicide of Gary J Shipley’s close friend, Conrad Unger (writer, theorist and amateur entomologist), has prompted him to confront not only the cold machinery of self-erasure, but also its connections to the literary life and notions surrounding psychological bewitchment, to revaluate in both fictional and entomological terms just what it is that drives writers like Unger to take their own lives as a matter of course, as if that end had been there all along, knowing, waiting. Like Gérard de Nerval, David Foster Wallace, Ann Quin and Virginia Woolf before him, Unger was not merely a writer who chose to end his life, but a writer whose work appeared forged from the knowledge of that event’s temporary postponement. And while to the uninitiated these literary suicides would most likely appear completely unrelated to the suicide behaviors of insects parasitized by entomopathogenic fungi or nematomorpha, within the pages of this short study we are frequently presented with details that allow us to see the parallels between their terminal choreographies. He investigates what he believes are the essentially binary and contradictory motivations of his suicide case studies: where their self-dispatch becomes an instance of necro-autonomy (death as solution to an external thraldom, or the zombification of everyday life as something requiring the most extreme form of emancipation), while in addition being an instance of necro-equipoise (death as solution to an internal thraldom, or the anguish of no longer being able to slip back comfortably inside that very everydayness). The deadening claustrophobia of human life and achieving a stance outside of it: both barbs on the lines that can only ever detail the sickness, never cure it. Through extracts and synopses of Unger’s books, marginalia and underscorings selected from his extensive library, and a brief itinerary of his movements in that last month of exile, a picture of the writer’s suicidal obsession begins to form, and it forms at the expense of the man, the idea eating through his brain like a fungal parasite, disinterring the waking corpse to flesh its words."